This is a very easy block to create. It's fun and different, can really be used any time of the year but was created for Valentine's Day. This is a 9-Inch block. It incorporates the techniques found on my blog with machine embroidery addons, but if you don't do machine embroidery, never worry, I've included all the parts for you to do this via handwork or blind stitch machine applique. 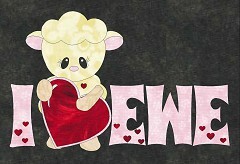 Embroidery Created in Bernina Designer Plus Software v7. The zip file includes the following: pdf info, art, hus, pes, and vip formats.